3M™ VHB™. Permanent double-sided tape; uniform, viscoelastic acrylic foam adhesive, high density and conformability. Ultra-clear, high peeling strength and good shear strength. Good resistance to ageing and excellent resistance outdoors. Used for permanent fastening as an alternative to mechanical fastening or welding. 3M™ VHB™. Permanent double-sided tape; uniform, viscoelastic acrylic foam adhesive, high density and conformability. Excellent resistance to plasticisers. High peeling strength and good shear strength. Good resistance to ageing and excellent resistance outdoors. Used for permanent fastening as an alternative to mechanical fastening or welding. 3M™ VHB™. Permanent double-sided tape; uniform, viscoelastic acrylic foam adhesive, high density and extremely high conformability. Ideal for bonding on powder painted surfaces without using a primer. High peeling strength and good shear strength. Good resistance to ageing and excellent resistance outdoors. Used for permanent fastening as an alternative to mechanical fastening or welding. 3M™ VHB™. Permanent double-sided tape; uniform, viscoelastic acrylic foam adhesive, high density and conformability. High initial tack, high peeling strength and good shear strength. Good resistance to ageing and excellent resistance outdoors. Used for permanent fastening as an alternative to mechanical fastening or welding. 3M™ VHB™. Permanent double-sided tape; uniform, viscoelastic acrylic foam adhesive, high density and conformability. High peeling strength and good shear strength. Good resistance to ageing and excellent resistance outdoors. Used for permanent fastening as an alternative to mechanical fastening or welding. Specifically for the Automotive sector, excellent resistance to petrol, diesel, wax washing. 3M™ VHB™. Permanent double-sided tape; uniform, viscoelastic acrylic foam adhesive, high density and conformability. High peeling strength and good shear strength. Good resistance to ageing and excellent resistance outdoors. Used for permanent fastening as an alternative to mechanical fastening or welding. 3M™ VHB™. 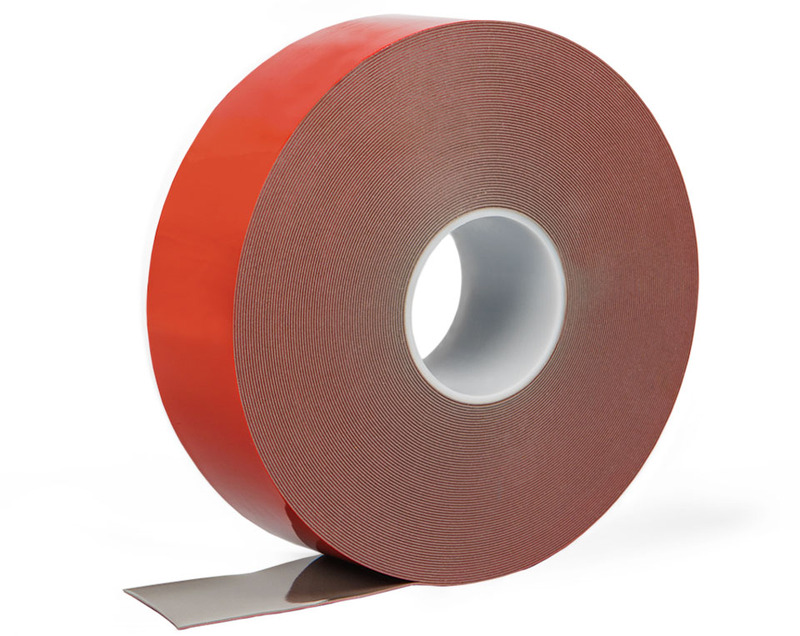 Permanent double-sided tape, very rigid acrylic adhesive system. Very high final bonding and exceptional shear strength. Excellent resistance to temperature, solvents and UV rays. Permanent double-sided tape, uniform, viscoelastic acrylic foam adhesive, high density. Used for permanent fastening as an alternative to mechanical fastening or welding. Excellent as sealant. Excellent resistance to high temperatures, weather and UV rays. The ultra-clear adhesive makes it ideal for an aesthetic finish. Clear foam, thickness 0.25 mm. Permanent double-sided tape, uniform, viscoelastic acrylic foam adhesive, high density. Used for permanent fastening as an alternative to mechanical fastening or welding. Excellent as sealant. Excellent resistance to high temperatures, weather and UV rays. The ultra-clear adhesive makes it ideal for an aesthetic finish. Clear foam, thickness 0.25 mm. White paper liner. Permanent double-sided tape, uniform, viscoelastic acrylic foam adhesive, high density. Used for permanent fastening as an alternative to mechanical fastening or welding. Excellent as sealant. Excellent resistance to high temperatures, weather and UV rays. Black anthracite coloured foam, thickness 0.4 mm. Permanent double-sided tape, uniform, viscoelastic acrylic foam adhesive, high density. Used for permanent fastening as an alternative to mechanical fastening or welding. Excellent as sealant. Excellent resistance to high temperatures, weather and UV rays. The ultra-clear adhesive makes it ideal for an aesthetic finish. Clear foam, thickness 0.5 mm. Permanent double-sided tape, uniform, viscoelastic acrylic foam adhesive, high density. Used for permanent fastening as an alternative to mechanical fastening or welding. Excellent as sealant. Excellent resistance to high temperatures, weather and UV rays. The ultra-clear adhesive makes it ideal for an aesthetic finish. Clear foam, thickness 0.5 mm. White paper liner. Permanent double-sided tape, uniform, viscoelastic acrylic foam adhesive, high density. Used for permanent fastening as an alternative to mechanical fastening or welding. Excellent as sealant. Excellent resistance to high temperatures, weather and UV rays. White foam, thickness 0.6 mm. Permanent double-sided tape, uniform, viscoelastic acrylic foam adhesive, high density. Used for permanent fastening as an alternative to mechanical fastening or welding. Excellent as sealant. Excellent resistance to high temperatures, weather and UV rays. Black anthracite coloured foam, thickness 0.6 mm. Permanent double-sided tape, uniform, viscoelastic acrylic foam adhesive, high density. Used for permanent fastening as an alternative to mechanical fastening or welding. Excellent as sealant. Excellent resistance to high temperatures, weather and UV rays. Black anthracite coloured foam, thickness 0.8 mm. Permanent double-sided tape, uniform, viscoelastic acrylic foam adhesive, high density. Used for permanent fastening as an alternative to mechanical fastening or welding. Excellent as sealant. Excellent resistance to high temperatures, weather and UV rays. White foam, thickness 1.0 mm. Permanent double-sided tape, uniform, viscoelastic acrylic foam adhesive, high density. Used for permanent fastening as an alternative to mechanical fastening or welding. Excellent as sealant. Excellent resistance to high temperatures, weather and UV rays. The ultra-clear adhesive makes it ideal for an aesthetic finish. Clear foam, thickness 1.0 mm. Permanent double-sided tape, uniform, viscoelastic acrylic foam adhesive, high density. Used for permanent fastening as an alternative to mechanical fastening or welding. Excellent as sealant. Excellent resistance to high temperatures, weather and UV rays. Black anthracite coloured foam, thickness 1.1 mm. Permanent double-sided tape, uniform, viscoelastic acrylic foam adhesive, high density. Used for permanent fastening as an alternative to mechanical fastening or welding. Excellent as sealant. Excellent resistance to high temperatures, weather and UV rays. The ultra-clear adhesive makes it ideal for an aesthetic finish. Clear foam, thickness 1.5 mm. Permanent double-sided tape, uniform, viscoelastic acrylic foam adhesive, high density. Used for permanent fastening as an alternative to mechanical fastening or welding. Excellent as sealant. Excellent resistance to high temperatures, weather and UV rays. Black anthracite coloured foam, thickness 1.5 mm. Permanent double-sided tape, uniform, viscoelastic acrylic foam adhesive, high density. Used for permanent fastening as an alternative to mechanical fastening or welding. Excellent as sealant. Excellent resistance to high temperatures, weather and UV rays. White foam, thickness 2.0 mm. Permanent double-sided tape, uniform, viscoelastic acrylic foam adhesive, high density. Used for permanent fastening as an alternative to mechanical fastening or welding. Excellent as sealant. Excellent resistance to high temperatures, weather and UV rays. The ultra-clear adhesive makes it ideal for an aesthetic finish. Clear foam, thickness 2.5 mm. Permanent double-sided tape, uniform, viscoelastic acrylic foam adhesive, high density. Used for permanent fastening as an alternative to mechanical fastening or welding. Excellent as sealant. Excellent resistance to high temperatures, weather and UV rays. Permanent double-sided tape, acrylic foam on PET support spread on both sides with thermal conductive adhesive. Developed specifically to dissipate heat. Silicon-coated liner, product V-O, U94 for flame retardant, Halogen-free, excellent resistance to ageing.